Dr. Gunnar is honored to be part of the Research Network on Toxic Stress and Health, a group with sites throughout the United States in collaboration with the American Academy of Pediatrics and the Harvard Center on the Developing Child. As part of the work of this Network, we have led two research studies working with Children’s Hospitals and Clinics of Minnesota: The Toddlers & Parents Study and the Toddler Attention Study, both described below. Adversity experienced early in life increases the risk for a variety of physical and mental problems accruing over the lifespan. These children are at increased risk for lifelong problems in learning, behavior, and health. Excessive stress may also increase risk for a host of chronic health impairments such as cardiovascular disease, hypertension, diabetes, addictions, and depression. However, not all children exposed to adverse conditions suffer these consequences. There is a clear need for measures to identify children whose health is affected by extreme stress. If addressed early, the impacts of early adversity can be reduced or reversed. Long before children get to school, pediatricians are in a good position to act as sentinels to identify the children and families who need more help. But how can pediatricians identify the children who need intervention because of excessive stress? 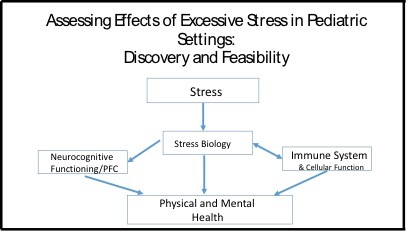 The figure shows the pathways through which excessive stress is expected to influence physical and mental health. The network we are part of is working to develop measures of stress, immune and cellular functioning reflecting adjustments to excessive stress and neurocognitive effects sensitive to excessive stress. The Gunnar lab is working on studies of stress biology and neurocognitive functioning. Figure 5. Pathways of how stress influence physical and mental health. Our Toddlers and Parents Study was our study of factors influencing stress biology. The Toddlers and Parents Study was conducted in two pediatric community clinics as part of Children’s Hospitals and Clinics of Minnesota. Cortisol is a hormone that is affected by stress and affects physical and mental development. We studied 190 children as they got either the 12, 15, or 18 month vaccinations. Secure attachment is important in regulating cortisol levels and reactivity. To measure attachment, a researcher followed the children throughout the clinic visit and during a free play session immediately afterwards. The researcher was observing how confidently the child used the parent as a source of security during the visit. Parents provided information about the family’s income, stresses, and the parents psychological functioning. Figure 6. 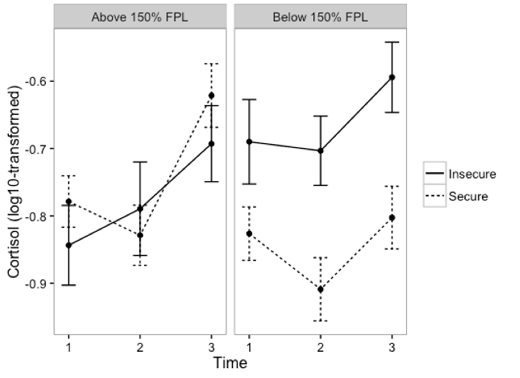 Cortisol responses at 1 – clinic arrival, 2 – after physical exam, and 3 – after immunizations. Some of the families attending these clinics were struggling with poverty and the results showed that poverty was associated with the toddler producing higher levels of cortisol overall during the well child appointments if the toddler was insecurely attached to the parent, but not if the relationship was secure. Poverty in Figure 6 is defined as being below 150% of the federal poverty limit (FPL). All of the children showed a cortisol response to the inoculations, which would be expected. But if you notice, the securely attached children, regardless of family income, show a decrease in cortisol or stress during the physical exam, while the insecurely attached children show an increase or start high and stay high in producing cortisol during the physical exam period. This suggests that they are not able to use the presence of the parent to buffer or lower stress during this part of the clinic visit. These findings tell us that we probably need to measure both the stressors in the children’s lives and the protective factors, like a secure relationship with their parents, in order to really identify the children in need of additional support. This could be challenging in a quick pediatric visit. Regulation attention is a facet of neurocognitive functioning that is very sensitive to chronic stress. But there are no good and easily deployed measures of executive attention regulation that are available before age two. Because regulating attention is so critical to self-control and capable functioning at school, early detection is really important. It is especially important because with early detection there are likely many interventions that could work improve children’s executive attention skills. The goals of the Toddler Attention Study are to determine whether infants/toddlers who experience stress in their families may demonstrate delays in the development of executive function, social orienting, and joint attention skills and whether these possible delays in attention development can be effectively assessed in the pediatric clinic setting using new tools. We have been working with colleagues in the Institute of Child Development who are developing tasks that use eye tracking to determine what babies are thinking and how they are processing information. Our goal is to figure out whether these tasks can be deployed on a tablet and used in the midst of a pediatric visit. And if we can get good data in that setting, we want to know whether the scores we are seeing for the children reflect chronic levels of family stress or not. This study is underway and we have currently completed 102 appointments with families of 9 month-olds (n=38), 12 month-olds (n=43), or 15 month-olds (n=21) at their well-child visits. We expect to complete this study by next winter and hope to share results with you in next year’s newsletter!